Part number on the back of this center cap is 9593259. 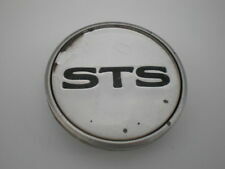 This has the raised Cadillac center emblem. THE FACTORY PART NUMBER IS #9595437. 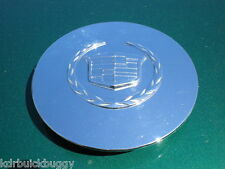 2004-2007 CADILLAC CTS AND 2005-2011 CADILLAC STS POLISHED ALUMINUM CENTER CAP. THIS IS A FACTORY ORIGINAL CENTER CAP. YOU ARE BUYING ONE CENTER CAP ONLY. 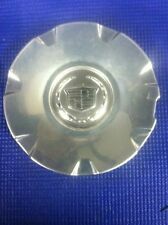 Up for sale a (1) Genuine Cadillac CTS Wheel Center Cap with part Number: 9594176. Few light scratches/imperfections/faiding here and there, all from normal use through all these years.. What you see is what you get. CADILLAC CENTER HUB WHEEL CAP - SET OF 4 - 6.625". GM# 03543663. Cadillac Eldorado 2DR Base 1994 ,1995 ,1996. Cadillac Deville 4DR Base 1993 ,1996 ,1997 ,1998 ,1999. Cadillac Seville 4DR Base 1993 ,1994 ,1995. Cadillac Deville 4DR CONCOURS 1998 ,1999. 2015-2018 Escalade. Always COMPARE the part number on this cap to the part number on the cap from your vehicle. Part numbers are stamped on the back of the hub cap or center cap. One of our photos in the ad shows the part number. One NOS OEM 1986 to 1990 Cadillac 14" aluminium wheel / rim. Part number on the back of this center cap is 9596478. Factory original center cap is used onone of the factory wheel options available on the 2007 2008 2009 2010 2011 2012 2013 2014Cadillac Escalade ESV and EXT using the 7 spoke 18" factory machined finish alloy wheel. Part number on the back of this center cap is 9597372. Part number on the back of this center cap is 9597489 or 9599024. This factory original center cap is used onone of the factory wheel options available on the 2010, 2011, 2012, 2013 and 2014 Cadillac SRX using the factory 7 double spoke 18" painted wheel. Part number on the back of this center cap is 9594176. This OEM factory original center cap is used onone of the factory wheel options available on the 2003 2004 Cadillac CTS using the factory 7 spoke 16" silver painted aluminum wheel only. UP FOR SALE IS A OEM ORIGINAL CADILLAC WHEELS. ONE OF THE RIMS HAS CURB RASH MARKS AND THE TIRE IS WORN NEEDS NEW TIRE. Few light scratches/imperfections here and there, all from normal use through all these years.. What you see is what you get. The sale is for One cap, not the whole set. Sale is final! SOLD AS IS.